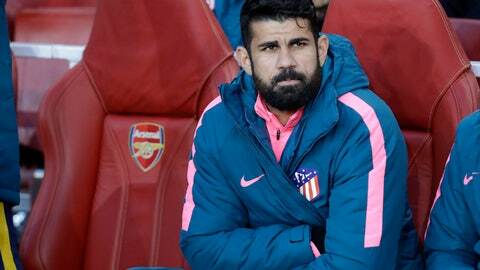 The 30-year-old Costa hasn’t scored in nine appearances for Atletico Madrid in the league this season, partly because he has been hampered by two muscle injuries which have also cost him a place on Spain’s national team. Saturday offers an ideal scenario for Costa to break out of his slump when Atletico hosts Barcelona on Saturday with the league lead on the line. Barcelona leads the competition by one point ahead of three teams, including Atletico in third place. Costa is expected to be cleared to play against Barcelona after returning to practice this week following an international break. True to coach Diego Simeone’s emphasis on keeping a clean sheet, Atletico is in the title hunt thanks to a stingy defense that has given it six wins, five draws and one loss. The team leads the league with only eight goals allowed, while scoring 16. That contrasts with Barcelona, which has scored a league-leading 34 times and conceded 18 goals. After an erratic start to his career when he was loaned out to several smaller clubs, Costa found a backer when Simeone took over the team in 2011. The match was perfect. Costa gave Simeone the enforcer on the field that he needed to inspire his code of maximum effort from his players. The result was the club’s most successful era. Costa helped win the 2013 Copa del Rey title and was the driving force in attack for Atletico’s 2014 league win. Costa returned to Atletico midway through last season after spending three years at Chelsea, where he won two Premier League titles. Despite only scoring three goals in the league, he helped Atletico win the Europa League title and finish second to Barcelona in the league. After scoring three goals for Spain at the World Cup, the Costa of old appeared to have resurfaced at the start of this season when he netted two goals in a 4-2 win over Real Madrid in the UEFA Super Cup in August. But his only other goal in any competition since then came on Sept. 18 when he scored in a 2-1 win at Monaco in the Champions League. Simeone still values Costa’s contributions even when he is not scoring goals. That said, Costa’s problem is not a question of lacking his scoring touch or running across inspired goalkeepers. He is not producing the scoring chances of a top-notch striker. Costa has only managed to generate seven shots in the league this season. Teammate Antoine Griezmann has three goals from 24 shots, while Barcelona counterpart Luis Suarez has scored nine goals from 36 shots. And it seems that Simeone may be losing faith in the player. Simeone substituted Costa at halftime of the 3-2 win over Athletic Bilbao after seeing he was incapable of threatening to score or set up a teammate. Simeone, however, doesn’t have a great second option if he wants to sit Costa against Barcelona. His only other true striker is the untested Nikola Kalinic. Otherwise, he could align another playmaker like Angel Correa or forwards Victor “Vitolo” Machin or Gelson Martins, or just bulk up his defense to slow down Lionel Messi.